Well, for reasons known only to the ISP, our bandwidth this AM is absurdly slow, so I thought a bit of a text update might be do-able if a lot of photos might now. We're stalled for the moment on the motor install waiting on a part, but as soon as that shows up we'll be doing tests on the system and taking some short trips and I promise to give you full details. In the meanwhile, I've had a lot of questions lately, especially on solar and composting toilet systems, so we thought we'd put out a call if there was anything you fine folks wanted to know that we haven't addressed. So please leave your questions in the comments below and we'll port them into a new Q and A post in a few days. All post will be anonymous, so feel free to ask away. New stuff over at Life, Art, Water, btw. Okay, so this is a bit of a tease. This motor install is going to take us several days and I'll be updating the blog here as it goes in. To recap, we're putting a 4.7KW electric motor in the space formerly occupied by an Atomic 4 gas motor. The motors are of equiv. horsepower (about 12) and drive the propshaft through a stuffingbox. (If these are new terms to you, believe me, you'll see). 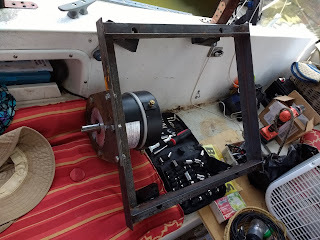 Our good friend Rich welded a frame for us to be able to mount the motor on the original bunks that held the gas engine (which was, of course, massively larger and heavier), and, at the moment, we're tweaking that to make sure the motor will align with with propshaft. Here's the frame with the motor affixed. Total weight is probably around 50 lbs. You can see how wide the space occupied by the original motor was. Anyway, stay tuned. We hope to have this in, up, and working over the next few days. 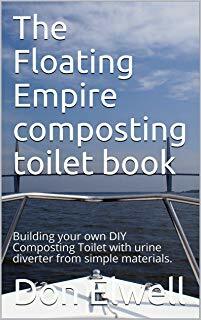 Things we've successfully used in a composting toilet. 1) Wood shavings. A slip mate gifted us with like eight garbage bags of em after doing some dock work and we used them all winter. They work well, but are somewhat messy. Avoid stuff from treated lumber. 2) Peat Moss. This works beautifully, comes in huge compressed bricks, and, in general suits the composting process well. It is also damn messy. It's a fine brown powder that finds its way everywhere in the boat. I'd use it if I had few other choices, as it does work, but it can be a pain. Wood stove pellets in the US are primarily compressed sawdust. They are compact, store well, and neat to use and, in general, are our fave for the composting toilet. At something like $5 a bag, they're also pretty cheap. Try for the ones that don't look like they're oiled or coated. Broken bags are fine (and dirt cheap) but make sure the stuff isn't damp or you'll find your head abruptly starts smelling. 4) "Natural" cat litter. AKA Wood stove pellets. Same thing generally in a smaller, more expensive bag, but available all summer, which wood stove fuel generally isn't. Please note: You can NOT use regular, clay-based cat litter. It turns into cement and will not compost. 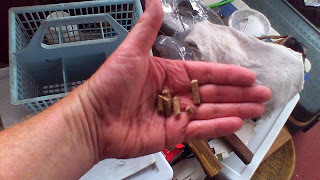 5) Wood smoker pellets: AKA Wood stove pellets. These things are used in automatic meat smokers and are identical to the ones used for heating except these are "food grade." They work fine and are available all summer and in all climes, but at around $16 a bag, they're pricey. 6) Sawdust. Yep, messy, but works fine. 7) Pet bedding: AKA wood chips. See #1. 8) Crushed, dried leaves. Works in a pinch. Tends to be a bit high in tannins for the composting process, but works. Coir (coconut fiber). I've seen it recommended. Available in some garden centers in compressed bricks. Shredded cellulose (wood, paper, etc). Should work. Never tried it. So we're waiting anxiously for our motor mount to get welded so we can get it in and get on the water. We've gotten a bunch of small stuff done: installed the transducer for the depth finder, built a small table for the cockpit and, in general, tried to tidy stuff up and make ready to get this beast mobile.